ETLG Inertial Aerosystems reports that the HMC2003 three-axis magnetic sensor hybrid now has traceability status. Each sensor is serialised and batch traceable, and ETLG's ISO 9001:2015 and AS9120B quality management systems record and track the data. Manufactured by Honeywell Aerospace, this high-performance, three-axis, surface-mounted magnetic sensor hybrid is designed to measure low magnetic field strengths. Incorporated are three of the highest grade magnetoresistive sensors, with instrumentation-grade electronics to measure the strength and direction of an incident magnetic field. The high bandwidth of this hybrid provides for anomaly detection of vehicles, aircraft and ferrous objects moving at high speeds. The HMC2003 features a 20-pin wide DIP footprint (25.4 x 19.05mm ), onboard 2.5V reference, 6/15V DC single supply operation, 40micro-gauss to +/-2gauss dynamic range, and an operating temperature range of -40 to +85degC; a temperature compensation circuit maintains bridge sensitivity. An RS-232 development kit is available that includes a Windows-compatible demo program, interface cable, AC adapter and carrying case. 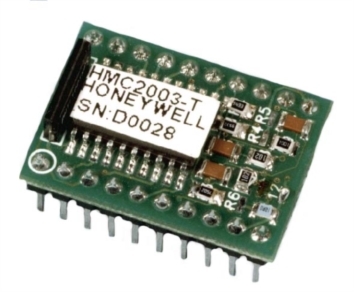 Applications for the HMC2003 include precision compassing, navigation systems, attitude reference, flight control, traffic detection, proximity detection and medical devices.